The traditional material culture is constituted by the artefacts and technological methods inherited or assumed from previous generations, through which the basic living needs and protection in the environment were ensured. It incorporates the traditional forms of employment (agriculture, shepherding, animal husbandry, fishing, beekeeping, etc.) and labour opportunities (basket weaving, woodcarving, tannery, shoe-making, the fur trade, weaving, cloth manufacturing, pottery, milling, logging, rafting, hauling, peddling, etc. ), types of residential houses and technical constructions, home-made and craft products made of various materials (clay, stone, wood, textile, glass, wicker) used at work, everyday and holiday life, food production and diet, clothing, art, transportation and the transportation of products, trade and market. The traditional residence is constituted by a residential house, courtyard and farm buildings. Individual types of residences are distinguished by the building material, construction, spatial segmentation, function and furnishing of spaces, furniture, etc. 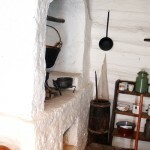 The development of residences was always related to the needs of the families, work methods, local construction techniques and traditions (for example in decorating). Folk architecture is characterised by its adaptation to the environment. Structures were built with local materials which were easily accessible and did not need any long or difficult transportation. The basic types of folk buildings are: residential buildings, farm buildings (shepherd’s farms, barns, stables, pigsties, hay barns, cellars, etc. ), production buildings (mills, pottery houses, bakeries, blacksmith’s shops, forges, etc. ), religious buildings (chapels, churches, wayside shrines, bell-towers, etc.) and public constructions (bridges, footbridges, ferries, etc.). In terms of folk architecture, Slovakia constitutes the contact territory of several types of buildings. Wood and clay were the fundamental materials. Wood was used especially in the northern forested parts of Slovakia, while clay was more commonly used in the southern parts. Ten most valuable sets of rural constructions have been proclaimed as Folk architecture reservations, which until these days constitute parts of inhabited villages. The following villages belong to folk architecture reservations: Brhlovce, Čičmany, Osturňa, Plavecký Peter, Podbiel, Sebechleby, Špania Dolina, Veľké Leváre, Vlkolínec and Ždiar. 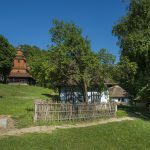 In Slovakia there are several open air museums – outdoor museums of folk architecture which enrich and make their expositions more interesting by manifestations of folk crafts, folklore and other interesting events. These open-air museums include the Slovak Open Air Village Museum SNM in Martin, Open Air Folk Museum of Kysuce Village in Vychylovka, the Museum of Orava Village in Zuberec, the Museum of Liptov Village in Pribylina, the Bardejov Spa Open Air Museum of Folk Architecture (within the framework of the Šariš Regional Museum), the Slovak Agricultural Museum in Nitra, the Open Air Museum of Folk Architecture in Humenné, the Ukrainian-Ruthenian Open Air Museum SNM in Svidník, the Ľubovňa Castle Museum and the Open Air Mining Museum in Banská Štiavnica. We use the term traditional folk diet to designate the food, drink and eating habits which were adopted from the family environment and were widespread in the village community. The food corresponded with the character of the natural environment, working rhythm, orientation and possibilities of the families in the sense of the self-provision of food, and the way of eating also reflected the cultural habits inherited from generation to generation. The primary sources and forms of acquiring a livelihood were constituted by hunting and gathering, crop cultivation and animal husbandry. The basic types of meals were made up of cereals, vegetables, fruit, diary, egg and meat. Fat and oil was also acquired from individual materials. Changes in folk diet were influenced by changes in local food production possibilities, the universal spread of trade and the availability of new materials, public education, published cook books, the introduction of eating out, etc. Traditional folk costumes (also called national dress) are the clothes characteristic for a specific location. According to those who wore these clothes we can distinguish men’s, women’s and children’s clothing, according to the seasonal winter and summer clothing, according to the function, eg. festive clothing, semi-festive clothing, everyday, working and professional clothes and clothes associated with an actual social status or state (for unmarried young women, unmarried young men, widows, mourning clothes, etc). The used material (linen, hemp canvas, cloth, leather and others), the cut of clothes and its colouring and decorativeness were reflected in an extremely rich and varied mosaic of traditional clothing in Slovakia and their regional, local and individual variations. One part of the traditional clothing (although walking barefoot was also widely spread) is also footwear. In Slovakia mainly leather footwear was used (peasant’s shoes, boots), shoes made of cloth (high felt boots, hoof boots) or knitted. The resulting garment was enhanced by the hairstyle and headgear (eg. hat, fur cap, decorative headband, garland, bonnet and scarf). Traditional home production is understood as the manufacturing of objects and various supplies carried out by the producers in their home for their own need or for sale. It may constitute their main occupation or only a side job. Crafts include specialised small-scale production requiring professional qualifications and social-professional organisations (guilds). The traditional production method is characterised by the use of one’s own tools, and accessible, especially natural materials, the predominance of manual work and therefore the original character of each product, direct and simple functionality and the use of traditional aesthetics for depiction and decoration.